Adrien Varachaud was born in Strasbourg (France) in 1977. 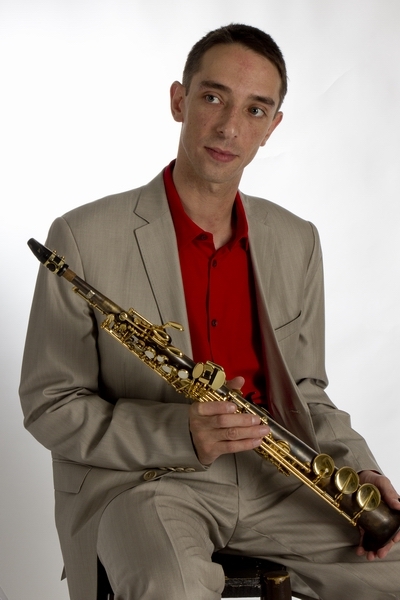 He made up his mind to become a professionnal saxophone player after listening to Hal Singer play at the Café des Anges in Strasbourg in 1994. Three years later he joined the « Jazz Contrast » big band and met Archie Shepp in 2000. Archie Shepp became Adrien's teacher and his friend and introduced him to well-known musicians like Mal Waldron and Ted Curson. In the summer of 2002, Adrien went to Dakar to study and play with famous Doudou N'Diaye Rose, an opportunity for him to improve his skill and develop his own sound. In that same year he was in the recording of one of Alain Aurenche's cds, with Christophe Brillaud as his piano accompanist. Later he visited Abdellah El Gourd (Master Gnaoua musician) to study and play with him and his Gnaoua group. Adrien caught the attention of the Alibi-Mal Waldron/Archie Shepp Jazz Club's manager and set up his own groups, first a trio with Katy Roberts and Rasul Siddik, and then a duet with Tom McClung. He set up the Unity 5tet in 2009 and gave a performance in Paris. His first record « Strange Horns » was issued in 2010. His drum player, Douglas Sides, invited him to play with Peter King and Steve Melling in London, and later, he was invited by Barry Altschul to join the « Fab Trio » (Joe Fonda, Barry Altschul, and Billy Bang) for a gig in Basel. Adrien was to meet Barry Altschul again in New York for the mixing of the recording of « Strange Horns » which was widely acclaimed by critics. After a gig with the Nu Band (Mark Whitecage, Roy Campbell, Joe Fonda and Lou Grassi), he formed a trio with Lou Grassi and Joe Fonda. At a gig in April 2011 Adrien met again pianist Christophe Brillaud, a fomer pupil of Aldo Ciccolini, and they decided to form a duet and to compose their own music. Adrien was invited by Hal Singer to join his 5tet for a gig in Chatou and the two saxophone players have regularly met since then. It was Adrien's turn to invite Hal Singer, on the occasion of his 92nd birthday, to join his Unity 5tet for two unforgettable gigs in Strasbourg. Hal Singer has now become Adrien's mentor, in the same way as Archie Shepp had been his teacher. As an open-minded musician, Adrien is not afraid of taking risks.